One of my favorite comic strips is Stephan Pastis’ Pearls Before Swine. A few months ago one of the main characters appropriately named Rat, since he is a rat, decides to open his own amusement park called Beer Land. The series of strips is amazingly brilliant, especially to true beer drinkers. I think the strip from that series that I most enjoyed was this one, because of the way Pastis linked a ride at the strip to the syrupy Disney ride It’s a Small World. 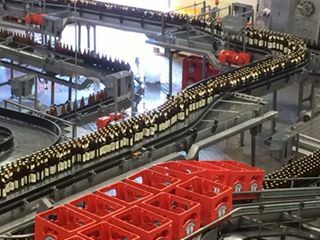 Today we did a bit of a road trip and took the U-Bahn from Munich to a small town on the outskirts of the city called Erding, for a visit and tour of the Erdinger Weisbier brewery, the largest brewer of wheat beers in the world. 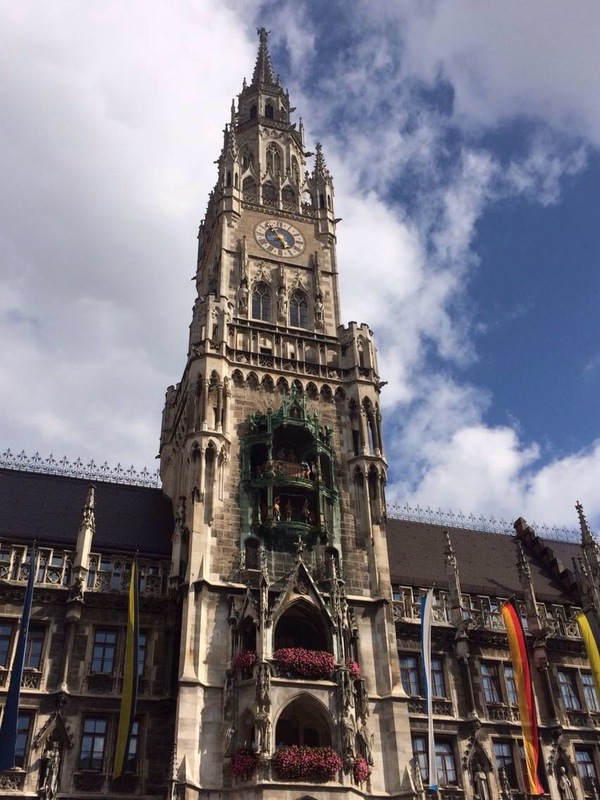 Before heading to Erding we had taken a short visit to the historic Marianplatz where we were able to see the famous Glockenspiel at the old city hall, or Rathaus. Now Judy has incurred a couple of injuries to her knee, ankle, and a couple of years ago had to her Achilles’ tendon repaired. As such sometimes a lot of walking causes her a lot, I mean a lot of pain. We tried to go out some yesterday but after a few minutes at Marianplatz but she was in such pain so we went back to our hotel until later in the evening when we went to dinner with our friends. This morning she was in less pain but she knew if she didn’t get some European style crutches that she would not do well and possible be confined to the hotel for must of our remaining time here. For those that don’t know, European or as they are referred to in the United States Canadian crutches are far superior to the type most of us know and loath so much. They provide the user much more mobility and less pain to the armpits and shoulders because you do not swing from them. So while she hung out with our friends I googled where to find the crutches in Munich. The word for crutches is krucken and they are sold at stores that specialize in equipment for those recovering from injuries as well as those with various physical disabilities called a Saniatshaus. The closest of these was about two miles away, so with google maps to guide me I set off. I walk pretty fast so it didn’t take that long to get there and when I did after the normal greetings with the lady at the counter I asked for a pair of crutches, which she showed me and allowed me to even pick the color. They cost about 34 Euros, which isn’t too bad, and for that quality I would have payed more in the U.S, had I gotten them at home. I made my way back by hailing a taxi to save time. Had a nice conversation about Munich, beer and the Oktoberfest with the driver and he delivered me back just city meters from where Judy and some of our friends had gathered. Since we were waiting on some of the rest of our group we had a beer at an outdoor cafe across from the Rathause where we saw the Glockenspiel do its thing when the clock stuck eleven. Once all of us were gathered we boarded the U-Bahn to Erding a trip of about 45 minutes. Once in Erding we caught a city bus to the Erdinger brewery. We got our tickets for the tours and bought a couple of items in the gift shop and then went on the tour. The tour took about an hour and a half and was amazing. I was impressed with how well a large brewery can make great beer using only the natural ingredients of hops, barley or wheat malt and water. There are no added sugars, food colorings known to be carcinogenic, Bisphenal A (BPA); cheap filler grains such as rice and corn as well as high fructose corn syrup, dextrose, and mono sodium glutamate, and even propylene glycol (a component of anti-freeze) are found in many mass produced American beers. This is because of the observance of the strict Bavarian or German beer purity law the Reinheitsgebot which stipulates what are acceptable ingredients in beer. Frankly the difference in taste is amazing as well as the effects, especially the morning after. But I digress…. As I mentioned the tour was informative and enjoyable. At the end of the tour, which cost 12 Euros per person we were provided freshly baked Bavarian pretzels, two large Bavarian Weiswurst, which are a mildly spiced and finely textured pork sausage and three half liter glasses of whichever of the eight styles of Weisbier that Erdinger brews. It truly was a visit to Beer Land and I am sorry to say that at each stage of the tour I kept thinking about that comic, but no, I didn’t see the German kid beat up the French kid for his Hefeweizen.